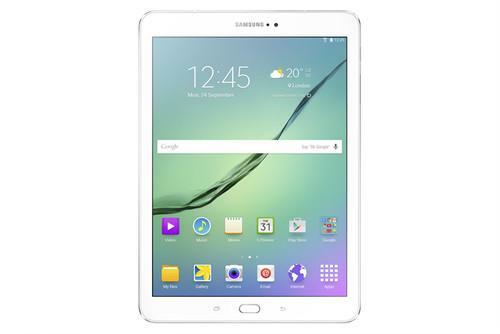 The Samsung Galaxy S2 Tab white version. The Galaxy Tab S2 will go on sale starting next month. To improve over the previous generation, the company has sought to trim down the product, at the expense of taking a few fractions of an inch off the display screen. As a result, consumers will be getting two sizes, one at a 9.7-inch, the other at 8-inch. The larger tablet weighs 389 grams, while the smaller one comes at 265 grams. In contrast, Apple's iPad Air 2 weighs 439 grams. Both Samsung's tablets come fitted in a metal frame that measures 5.6 mm in thickness. In addition, the products feature a 2048 by 1536 pixel Super AMOLED screen. The display, combined with the compact physical design, make the tablets perfect for reading and viewing digital content, according to the South Korean electronics giant. However, the products have a slightly lower screen resolution over the 2560 by 1600 pixel displays found in their predecessors. Samsung declined to give a price, but the two products appear to be higher-end. They each come with a fingerprint scanner, along with Samsung's eight-core chip, which has two quad-core processors, one running at 1.9GHz, the other at 1.3 GHz. Both products have Android 5.0 installed, and have an 8 megapixel rear-facing camera, and a 2.1 megapixel front-facing camera. Inside is 3GB of RAM, and the tablets can come with either 32GB or 64GB of storage. Also attached is a microSD card slot for an additional 128 GB in memory. Samsung will have both Wi-FI and 4G versions available. The company is the world's second largest tablet vendor behind Apple, according to research firm IDC. In the first quarter, it had a 19.1 percent share, compared to Apple's 26.8 percent. But even as Samsung has been competing hard against its rival, it has been limited by the Android OS. Google's operating system simply has fewer apps designed for the tablet, when compared to Apple's iOS, said IDC analyst Bryan Ma. To stay competitive, Samsung has to find other ways to stand out. "Samsung doesn't want to be in a position where 'Oh, the iPad Air is thinner and lighter than everybody else's product,'" Ma added. "It's basically a Galaxy Air," he said of the product. "This is just Samsung's response to the products Apple keeps bringing out."